Since the tales of "Shrek" and "How to Train Your Dragon" were created, all kids love dragons. They dream of long journeys on the back of a great pet because who can resist the allure of the fire-breathing, fabulous guardian who is allowing you to watch the beautiful world of the skies of heaven? Donkey's wife from Shrek.. sure was a great mom! Unfortunately, we cannot give our children the real dragon. 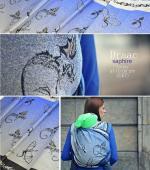 But we have created a beautiful wrap with a real, woven gradient, that has not been done before. In order to highlight the beautiful space where our legendary heroes are moving, we created a blue gradient, which imitates the sky. We wish all those who fall in love with this wrap and especially the little ones wonderful dreams in the Dragon wrap about the sky friends. 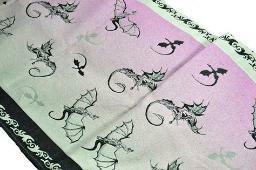 Wrap is 100 % cotton 340 g/m2 and available today in very limited quantity.